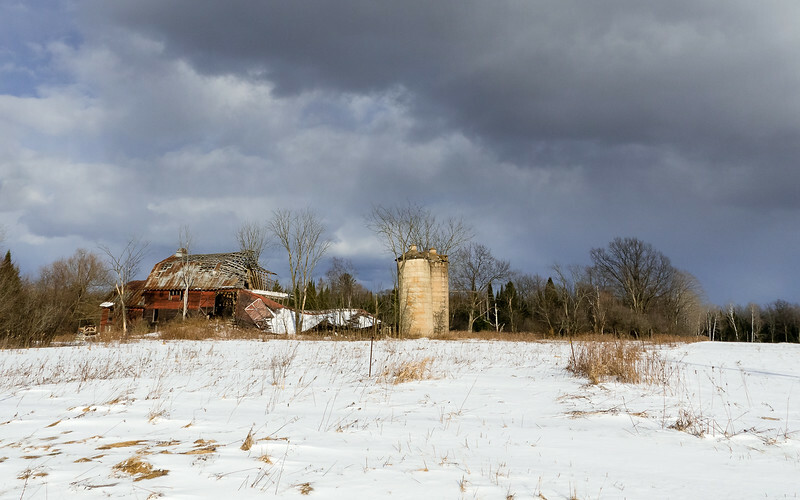 Living in central Wisconsin means there is a lot of space and farms, but because of the way farming has been destroyed for individuals and families, there are a lot of abandoned farms and homesteads. It’s sad, but they make for some excellent photos. Many photographers automatically go for a black and white image and I do, too, but sometimes it does’t fit the mood. Some of that comes from the light and weather conditions when I go out. As many other subjects, overcast or cloudy skies work pretty well and I often head out when it’s like this. I find the flat light lets my photos show the structure and surroundings of a ruined building a bit stronger than direct light. When I want to emphasize those two things I’ll often choose monochrome to help. The shot below is a good example. 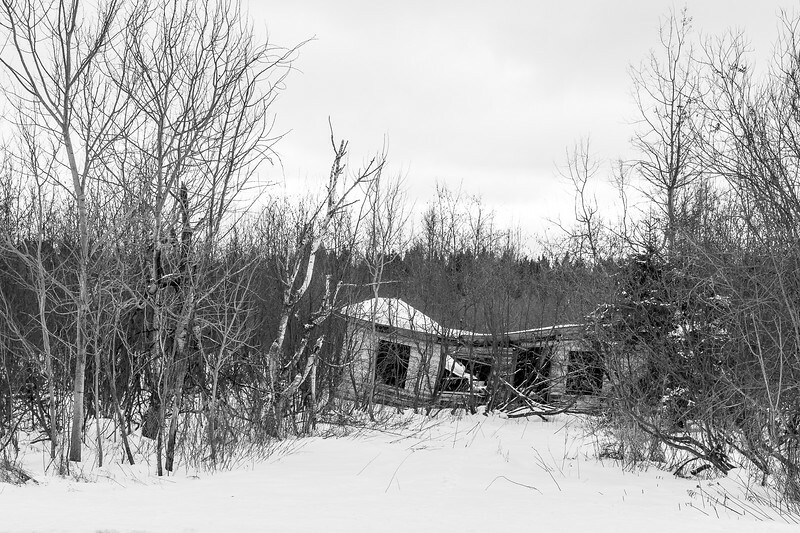 A one-story cabin with the roof caved in, but with still discernible windows and doors – black and white lets a viewer focus on those and not the riot of saplings that have taken over what must have been the yard. Not all days are overcast though and when it’s bright and sunny out we have a bit more texture to show and also the contrast between the mood in the scene and the past lives that must have once centered on the abandoned house. It almost makes it cheery to look at until you realize that possibly someone’s hopes and dreams have died hard. This next cabin’s missing doors is a focal point and there is enough color to showcase it. Also the colors are so complementary that it makes for a really harmonious image. Overexposing a stop keeps the snow white, too, and so even though I experimented with black and white I decided color was the way to go. To trespass or not to trespass? I’m always tempted, but most of the time I don’t approach or enter any of the abandoned buildings I find. Mostly out of craven fear – I don’t want to get caught. Also out of respect. If there is a sign saying keep out (like the one at the end of my driveway) I take it seriously. Not only are there the property owner’s wishes to be respected, but there’s liability, too. I can imagine how damaged and dangerous these places are and I have no wish to wreck myself or cause the owner to have a big bill because of my stupidity. It is tempting though and I will get closer when it makes sense. 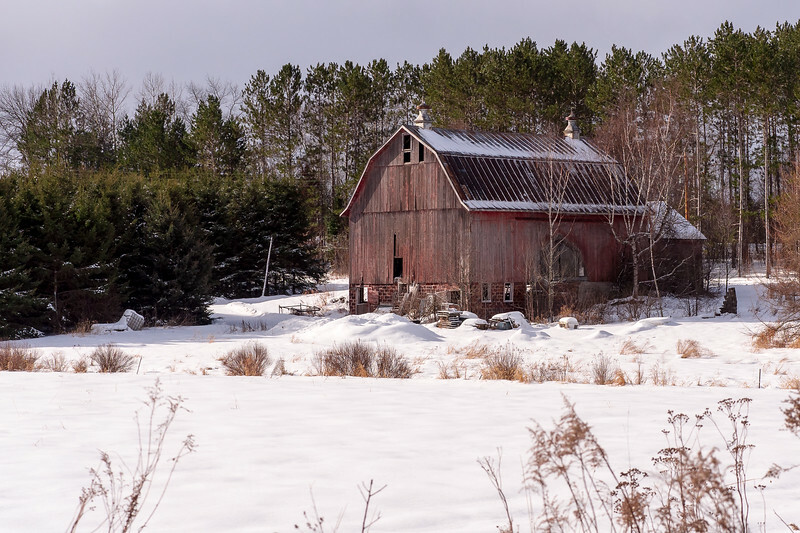 In the case of this barn, if it had been in the company of a ruined house and outbuildings, I’d have gone closer. But it was the only thing like this on an otherwise totally normal, and inhabited farm. Poo. Because there are so many abandoned homes up this way I sometimes pass them all the time without taking any pictures. With this next one I’ve been promising myself that I would stop when the light was right. Yeah, yeah, yeah. I just felt a little silly stopping right on the side of a road I travel once or twice a week. But then one day I was coming home with the whole rig in the car and the afternoon light was pretty perfect. In terms of processing, I did tweak these a bit more than I normally do so I could set the right mood. I wanted something a touch brooding…mostly because of that awesomely scary tree. The clouds helped, but they weren’t quite dark enough so I brushed them a little in Lightroom to bring up the drama. I also tweaked the magenta slider down a bit toward green, keeping it even between the two shots which are different views of the same farm. To me it’s important to keep the processing the same with a series of images that you want to present together. Lightroom has some shortcuts that are handy for this, too, like letting you apply the exact same set of adjustments from one image to another. Just finish up or click on a previously processed image in the develop module, click directly to another image and then hit the Previous button in the lower left. It will apply the changes you made to the first image to the second one. From there you can keep it or do more to it, even undo something like a crop that doesn’t work. It makes things really easy to keep the same look and feel with multiple images. Then there’s luck. 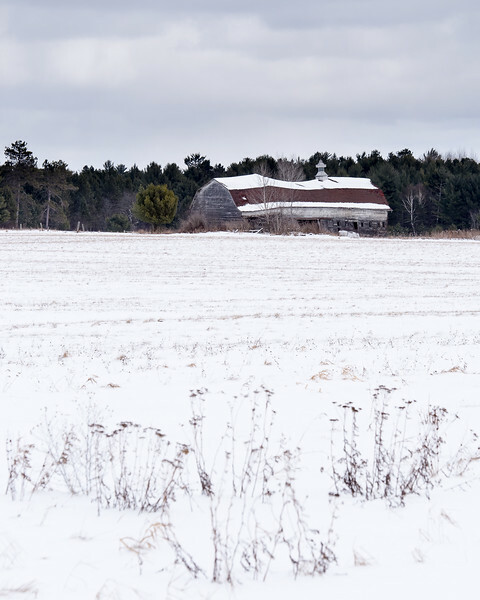 I went back to photograph this barn on an overcast day. Even when I got there and climbed the snowbank the light was pretty flat. Then for a brief few moments the sun broke through the clouds a little bit. Just enough to bring up some texture and shadows. It was all I could do to keep from jumping up and down. Love this series. I, too, am always fascinated with structures past their prime — and it certainly does inspire reflection on what lives were lived there, through good times and bad. Thanks so much guys. I used to photograph old cemeteries and now it’s this. Your photographs capture the scene perfectly. It makes one wonder, who was there, what was their life like, what made them abandon that house and how.All in all, they captured the scene with poise and elegance giving it a calm sort of tone. 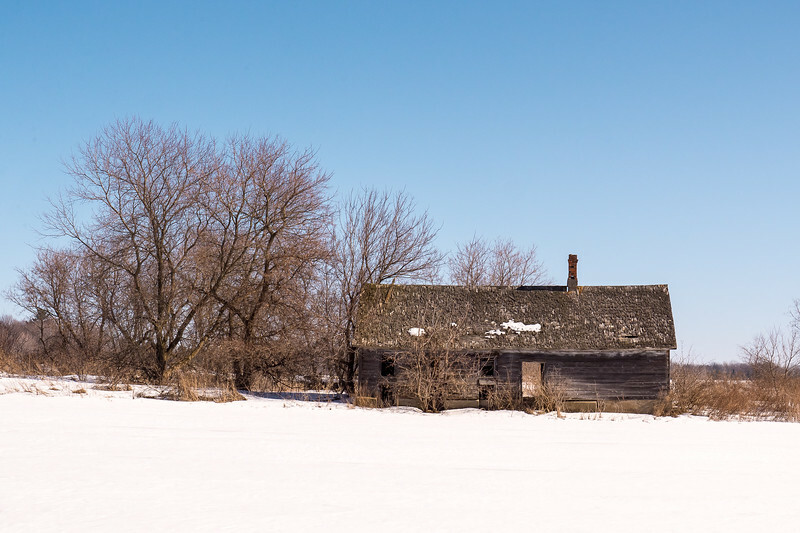 I’m originally from a small town (under 800 people) in the Midwest, and I remember as a kid stopping and peeking in windows of abandoned farmhouses and seeing the left-behind furniture, kitchen items, even clothing on hangers left fluttering in the wind through the shattered windows. I always wondered how and why during the final move, the former homeowners didn’t take all possessions with them. It was like looking into an eerie time capsule. 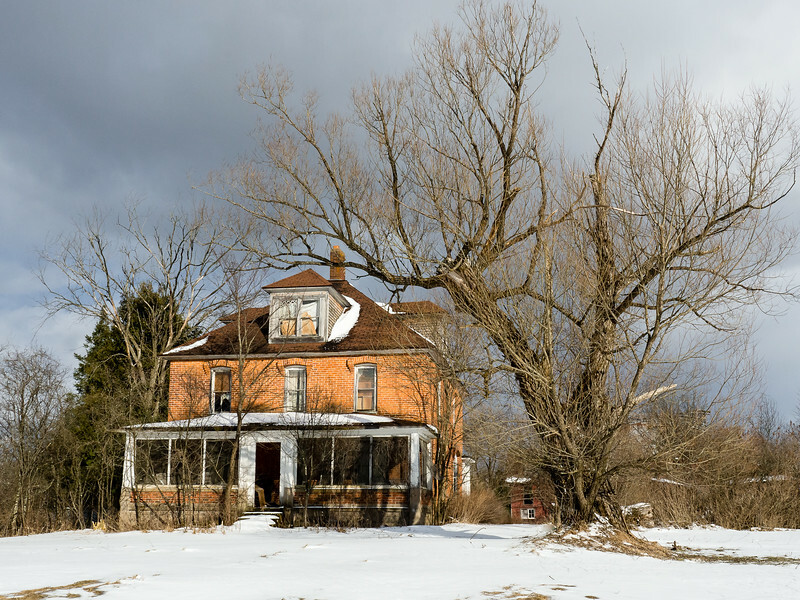 It does make you wonder, even if you probably know it’s a boring story – person gets old, gets sick, dies/goes to nursing home, no kids or the kids can’t be bothered to care about the old homestead. Very sad in some ways, especially when there are things left behind like you say Morpheus. I’ve found a few like that and it’s almost like walking among ghosts.